BERLIN - Gary Van Etten admits he has the easy job. Every game, the Berlin Legion Baseball head coach will signal to catcher Ryan Hyde the pitches he wants thrown and then Van Etten just has to sit back and wait. He knows his pitchers will take of everything from there. Over the course of the summer, Berlin has been one of the most difficult teams to score on. 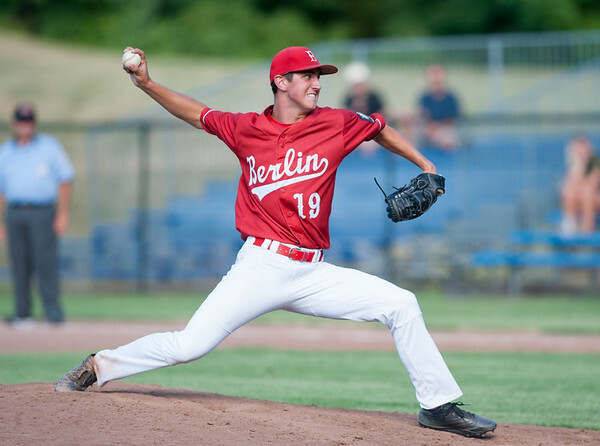 In 19 games this season, Berlin has given up just 37 runs, an average of just 1.95 per game. The 37 runs given up are the seventh best in the entire state, excluding Zone 3, which doesn’t have the stats available online. And of the team’s 14 wins, five have been shutouts and seven have been by only allowing one run. “We just have a lot of guys on our staff that love to come out and compete,” Hyde said. Matt Vernacatola has stepped up as one of the aces of the squad. He had one of his best games of the season Thursday, a 4-3 Berlin win over RCP, which was second place in the zone heading into the game. Vernacatola believes the entire staff, not only him, deserves credit, especially for the extra work they put in that isn’t seen on game days. While Hyde is the constant, in that he works with the entire pitching staff, he quickly deflected any credit for the staff’s success. Despite the focus on pitching and defense, Vernacatola, meanwhile, wanted to highlight the team’s support on offense, which consistently finds ways to grind out enough run support to help the pitching staff, especially in the RCP game, where the offense battled back after falling behind late. Berlin has already clinched a postseason berth and has just two games remaining on their regular season schedule. If the team wins either of those two games, it will secure the top spot in Zone 7. Posted in New Britain Herald, Berlin on Friday, 13 July 2018 21:28. Updated: Friday, 13 July 2018 21:31.